Berlin is the venue for the 2018 FESPA trade fair. At stand B30 in hall 1.2, Marabu will be presenting its proven portfolio of inks, plus many new solutions in screen and pad printing for food packaging, operator control panels and glass. It will also showcase a number of digital printing solutions – including its versatile new GBL-free solvent-based inks and an expanded range of UV-curable inkjet products. Moreover, it will spotlight the advantages of digital water-based options. Food packaging has to perform a variety of tasks: it should present the product to catch the eye and encourage consumers to make a purchase – and, above all, it has to protect its contents. For this reason, inks for food packaging are subject to strict quality audits to verify that they are not susceptible to migration (i.e. the transfer of substances from the packaging material to the foodstuff). Marabu’s new Ultra Pack UVFP is the first officially approved (by Swiss Quality Testing Services, SQTS, a certified institute) for migration-sensitive PE/PP plastics – the materials most widely used for packaging foodstuffs. Moreover, the very high reactiveness of UVFP inks ensures rapid drying and printing speeds of up to 4,000 containers per hour. Marabu is adding two ink ranges for diverse glass applications. The single-component Mara® Tech MGO baking ink is ideal not only for glass, but also for screen and pad printing on metal where high resistance to chemicals is crucial. The ink contains silicone, and is therefore suitable for both first and second surfaces, in particular for container and flat glass. As a single-component product, it ensures highly reliable printing processes. This makes Mara® Tech MGO the perfect choice for sensitive goods, such as baby bottles, drinking glasses and medical accessories. Marabu will also spotlight its two-component Mara® Glass MGLA. This ink was developed for second surfaces on flat glass items, for example smartphones, input systems (touch panels) and outdoor user interfaces – including control units for ships and boats, and digital map terminals in Berlin and other major cities. Capacitive touch interfaces are found in a wide variety of appliances, including washing machines, driers, dishwashers and ovens – and even coffee machines and microwaves. The latest devices are equipped with state-of-the-art front panels and integrated touch panels. Marabu’s Mara® Panel MPA, a new range of specialty decorative inks, features an outstanding opaque white, plus a deep, nonconductive black developed for printing on the back (second surface) of popular PMMA or PC plastics. Mara® Panel MPA displays very high electrical resistance to avoid interference with the input system’s functionality. Furthermore, the range has been tested for resistance to water vapour and to common cleaning agents from leading manufacturers. In many cases, household appliances feature plastic panels within a metal housing. Marabu offers solutions for the entire device, even if individual components are made from differing materials, i.e. plastic, metal or glass. Product safety is the top priority at Marabu. This year, for instance, the company is launching a new generation of GBL-free solvent-based inks for digital printing in wide formats. Marabu customers will be able to choose between existing solutions and new, highly versatile GBL-free versions. Marabu’s UV-curable inkjet inks can be employed in a variety of situations, and are compatible with all common printer heads. The offering includes flexible Ultra Jet DUV-A inks for wide formats, and the Ultra Jet DUV-C range for printing directly on flat glass and on containers made from glass or PET. There is also an alternative line of inks for Océ Arizona printers, Ultra Jet DUV-GR, plus LED-curable Ultra Jet DLE-A products. Moreover, Marabu’s UV-curable portfolio now includes two new lines: Ultra Jet DUV-MF is very versatile, and was developed especially for wide-format graphical applications. These products belong to a new generation of highly reactive inks that enhance roll-to-roll and hybrid printer productivity. Furthermore, Marabu has a new specialty ink for both indoor and outdoor POP/POS applications. It features an especially glossy finish and a wide colour gamut. water-based systems outweigh other considerations. Toscotec’s steel Yankee dryer TT SYD-18FT was successfully fired up at Fujian Jinmin Reconstituted Tobacco Development Co., Ltd., a subsidiary of China National Tobacco Corporation, at its Luoyuan mill, Fujian, China. The TT SYD reached top performance immediately after start-up at the end of March. The advantages of TT SYD can benefit all grades and types of paper, not least reconstituted tobacco paper. After Toscotec’s successful reconstituted tobacco application in the U.S., the Chinese reconstituted tobacco paper producer Fujian Jinmin is now operating a big diameter TT SYD, which guarantees top drying efficiency at the lowest possible consumption cost. From the delivery of the first TT SYD in 2000 throughout 18 years of successful and safe applications and two generations of design, this achievement further reinforces Toscotec’s position as the number one supplier of steel Yankee dryers worldwide. The number of TT SYD sold in five continents around the globe has recently reached more than 200 units, way ahead of the competition. Based on its ever-growing experience, Toscotec has constantly been upgrading its design and it is currently in the process of honing the third generation of TT SYD. At MIAC, you can meet more than 270 International Companies in just three days and only in one place, for a full overview of the technology and the equipment available to the Paper Industry and the Tissue Converting sectors. Machinery and plants for the production of Paper and Paperboard and for the converting of Tissue Paper. On 10.11.12 October 2018 in Lucca/ITALY. Come to Lucca in ITALY this October and meet 270 International Exhibitors ready to show you their solutions. Watch the video interviews with some of the MIAC Exhibitors and discover why it is worthy visiting the Exhibition of Lucca! Download the Invitation Ticket of MIAC in PDF format! Print and deliver it directly at the reception of MIAC in order to receive the free Admission Card. Search the machinery and equipment of the Exhibitors. Browse between the items to see which companies produce the product of your interest! Solenis, a leading global producer of specialty chemicals, has introduced its new MicroSolSM advanced retention and drainage solutions to help printing and writing paper producers stay competitive through increased productivity and superior product offerings. MicroSol is a revolutionary technology package that combines the company’s new patented PerForm™ SP7242 structured polymer with its uniquely structured PerForm™ MP9031 colloidal silica to give printing and writing paper producers a no-compromise solution for maximizing retention and drainage without sacrificing formation in the manufacturing process. As a result, papermakers enjoy a wider operating window that increases flexibility, improves machine efficiency and reduces operating costs. 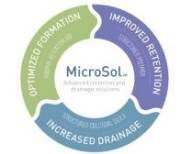 "MicroSol builds on Solenis’ vast experience with retention and drainage aids," said James Woodward, marketing manager, Printing and Writing - North America. "We significantly changed the retention and drainage landscape when we introduced our patented PerForm SP structured polymer in the early 2000s. Early generations of PerForm SP set the bar for first-pass ash retention. Now, with the introduction of PerForm SP7242 and our MicroSol package, Solenis is raising the bar even higher. To complement this technology, we’ve also created PerForm MP9031, a colloidal silica that adds to the retention initiated by PerForm SP yet promotes excellent drainage." PerForm SP molecules are highly anionic, three-dimensional structures that interact readily with cationic sites on fibers, fines and fillers in the forming paper. This structure allows the molecules to grab hold of ash and distribute it evenly to increase paper strength, retention and formation. The PerForm MP colloidal silica offers a similar microstructure developed with attention to its size, surface area, structure, surface modification and solids content to ensure optimal performance in today’s paper machine processes. Used together, PerForm SP and PerForm MP offer a dynamic breakthrough combination that gives papermakers the ability to maximize retention and drainage without sacrificing formation. Solenis designed MicroSol as a flexible component in a papermaker’s retention and drainage program, which could also include cationic or anionic polyacrylamide. The end result is a controllable program with a linear dosage response that offers papermakers an improved operating window with more versatility. The Procter & Gamble Company (NYSE:PG) announced it has achieved many of its 2020 environmental sustainability goals, has plans in place to meet the rest and has established new, broad-reaching goals for 2030. The new goals, titled “Ambition 2030,” aim to enable and inspire positive impact on the environment and society while creating value for the Company and consumers. -Brands: P&G’s 20 leadership brands including Always, Ariel, Dawn, Fairy, Febreze, Head & Shoulders, Pantene, Pampers, and Tide will enable and inspire responsible consumption through packaging that is 100% recyclable or reusable, launching more sustainable innovations, and building trust through transparency and sharing our safety science. -Supply Chain: P&G manufacturing sites will cut greenhouse gas emissions in half, and will purchase enough renewable electricity to power 100% of our plants. The Company will also source at least 5 billion liters of water from circular sources. -Society: P&G will continue to create transformative partnerships that enable people, the planet and our business to thrive, including those that stem the flow of plastic into the world’s ocean, protect and enhance forests, expand recycling solutions for absorbent hygiene products, and protect water in priority basins around the world. -Employees: P&G will engage, equip and reward employees for building sustainability thinking and practices into their everyday work. We will reward progress and integrate recognition into performance assessments. Palcut supplies anti-slip paper for stabilising finished products stacked on pallets. This ensures the best possible transport of the goods – both during internal transport by truck within the warehouse facilities, and externally by lorries and other means of transportation. Palcut's anti-slip paper, Antim®, is available as both pre-cut sheets and in rolls for cutting. The anti-slip paper is available in all sizes to suit the relevant packaging/production line. Antim® paper has an extremely high friction coefficient. The advantage of this is that a pallet of finished products can be tilted at an angle of up to 50° without the goods falling off the pallet. The increased stability of the goods placed on Antim® interlayer sheets is also very noticeable during transport, where the pallet remains stable in the event of poor and uneven roads and hard braking. Recently, Palcut asked a renowned testing facility in Germany to test the friction coefficient of its anti-slip paper, Antim65® and Antim Light®, which is used as interlayer sheets on pallets. The results were very positive. The Antim65® paper has a friction coefficient of 0.92 for 110g/m2 Antim65® paper when placed on polished steel, which is the reference in this kind of test. The measurement is a so-called dynamic test that corresponds to a transport situation. This is a good result, especially when compared to a standard rough cardboard box with a friction coefficient of about 0.4, and 0.1-0.2 for a smooth bag of animal feed, for example, placed on the same polished steel sheet. "The test clearly shows that our Antim® anti-slip paper has a positive effect on palletisation and pallet stability. We are not just saying that," says Lars Østergaard Jonasen, Product Manager at Palcut. Check out the test results in the table above, and contact us for more information about the paper and the benefits of switching to Palcut's Antim® anti-slip paper. Under the motto “Ready for the next step!”, Koenig & Bauer invited trade professionals to its Radebeul facility in the second half of March to learn more about the benefits of rotary die-cutting on the Rapida RDC 106 in packaging, label and commercial production. During the course of each one-day workshop, up to 20 participants were able to test the claims made about the innovative rotary die-cutter for themselves and gained a first-hand impression of its performance capabilities. The Rapida RDC 106 brings printed sheets into final shape both efficiently and precisely, whether labels, business stationery or folding cartons. With production speeds up to 15,000 sheets/hour, makeready savings of 40% and more, and up to 65% higher efficiency, the Rapida RDC 106 is a genuine game-changer compared to traditional flat-bed die-cutters. At the same time, different equipment variants for the individual units enable several processes to be combined on a single pass through the machine: Die-cutting/kiss-cutting, hole punching and extraction, creasing/embossing, stripping – everything is possible. The Rapida RDC 106 is a single machine handling five technologies for three market segments. During the workshops, the visitors witnessed high-speed die-cutting production and fast job changeovers. The demonstrations were tailored to the interests of each group and ranged from pencil boxes and pharmaceutical packaging to banderoles, self-adhesive stickers and a diversity of labels. The two demo machines processed not only 60 µm inmould label films, but also 260 gsm board. Alongside the practical presentations, the workshops offered ample opportunity to explore the technical details of the Rapida RDC 106. Technicians and operators willingly opened guards and covers to allow the visitors a close-up view of the die-cutting units, where they could familiarise themselves with the high-precision adjustments (e.g. setting of the die-cutting pressure in 1 µm steps, separately for each side) and follow the fast forme changing with their own eyes. With its high production speeds, the Rapida RDC 106 is ideal for long runs, but thanks to the fast job changeovers equally economical on short runs. The times in which two die-cutters were necessary to keep pace with the print output from a sheetfed offset press are a thing of the past with the Rapida RDC 106. Early adopters and further prospective users of the rotary die-cutter Rapida RDC 106 are already to be found in Germany, Denmark and France, and even as far afield as Brazil and Japan. The 2018 financial year started very strongly for Södra. In the first quarter, operating profit rose more than 90 percent to SEK 938 million (490). We are seeing the positive effects of our extensive investment programme as well as of the completed structural changes and rationalisations. Efforts with new innovations and to create a more sustainable Södra are continuing unabated. The first quarter of 2018 was very strong for Södra. Net sales rose to SEK 5,717 million (5,098) and operating profit improved markedly to SEK 938 million (490). The operating margin was 16 percent and return on capital employed was 22 percent. Cash flow before investments was SEK 1,275 million (492). The equity ratio of 58 percent was excellent. The are several reasons for the robust earnings trend. The favourable global economy contributed to high demand and a positive price trend for Södra’s products. We are also seeing the positive effects of our comprehensive investments to expand our pulp mills. Underlying profitability has improved, reflecting the strong demand for market pulp. Demand and prices are also favourable in the sawn timber segment, and operating profit rose sharply year-on-year. The multi-year plan launched in 2016 to improve underlying profitability is ongoing, with continuing rationalisation, a focus on market orientation and investments in efficient processes. In engineered wood, the investment in CLT (cross-laminated timber) is also progressing as planned, and Södra Building Systems has been established to support the initiative. In the house-manufacturing area, the beginning of the year was weaker compared with 2017, mainly due to the introduction of mandatory home loan repayments. Based on the order book, the future trend looks better. The supply of raw material to our mills could be effectively maintained, despite the need for re-prioritisation with account for the entire Group. The situation was sometimes problematic due to the weather conditions with soft, wet soil and heavy snow, which reduced the transport capacity. Overall, Södra’s raw material stocks are currently favourable. Södra also strengthened its market offering of pulpwood and pine logs during the period. Efforts with new innovations and to create a more sustainable Södra have continued unabated. Södra’s investments to increase liquid biofuel production are progressing as planned. These strategic investments in the future are helping to create new business opportunities, and constitute steps towards a fossil-free society, and a sustainable bioeconomy in which forestry has a key role. The business policy frameworks are therefore of major significance for the forest industry, and for the ability of Swedish forest owners to pursue active and sustainable forestry. There are many indications that these favourable economic conditions could continue for some time. Key drivers are the growth of world trade – especially online trade, the need for more packaged goods, rising demand for renewable materials and a growing focus on initiatives to achieve a more sustainable society. At the same time, we are also witnessing an emergence of protectionist tendencies, with actions that threaten to restrict free trade. Such developments could have a major negative effect on the global economy. The geopolitical tensions in Syria are also worrying in many ways. Despite this risk scenario, the current market conditions indicate a continuation of Södra’s positive trend into the next quarters of 2018. It is also particularly pleasing and stimulating that Södra was named Sweden’s most attractive employer in 2018 by Randstad Employer Brand Research.